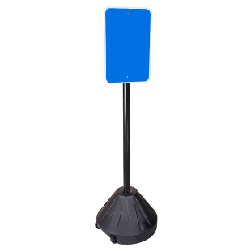 This portable sign holder is strong, stable, and easily movable! This signpost system gives you the flexibility to get your message exactly where it needs to be seen. Great for parking lots, special events, and temporary uses. Base of stand has wheels allowing the stand to be moved. Pre-drilled holes for signs from 9”x12” to 24”x24” and 12”x36"